See more work by Zulfikar Ali Bhutto here. Zulfikar Ali Bhutto is an artist of mixed Pakistani and Lebanese descent and spent most of his life in Karachi, Pakistan. His practice investigates complex identity politics formed by centuries of colonialism and exacerbated by contemporary international politics. 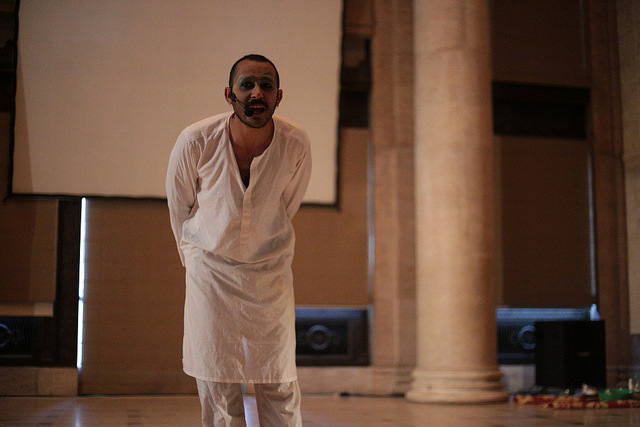 In his performances he explores the politics of queerness, its intersections with Islam and how it exists in a constant liminal and non-aligned space. Bhutto has performed and shown work in the U.S, Colombia, Pakistan and Dubai. Read our interview with Zulfi below to learn what it's like for him to perform. What are you currently intrigued by? I’m currently intrigued with the idea of solidarity, how to cross boundaries and understand intersections of oppression and violence, understanding what it means to be Muslim in the U.S. and building solidarity networks with other communities. The ability to see how the genocidal politics of the government of Myanmar towards its Rohingya Muslim community connect with histories of colonialism and modern day American imperialism. If your favorite dessert had a performance persona, what would it be? My favorite desert does have a performance persona. Her name is Faluda Islam, named after the desert drink: Faluda. She’ll be making an appearance during my performance. She’s always hogging the spotlight. Considering the context of your work, what happens when your audiences can't meet you where you're at? This is question would warrant a very long answer, one that I am still answering with every performance that I do. I work in a variety of mediums and even within performance I engage with multiple spaces from galleries to independent theatres, literary spaces and nightclubs. There are performances that I work on for years that constantly evolve only because they could go that step further and there are others I do and feel content with a single iteration. I also change performances depending on the audience. If I’m performing at a South Asian drag event, I will speak my language and fill the performance with signifiers that those who are not South Asian may find alienating vs, when I perform at a club in the Castro or SOMA, I make the performance ‘hella basic’. The nightclub is where I aim to make a clear point to a much more mass audience, the audience that I may not be able to reach if I stuck to a gallery. In that sense I try my best to help them meet me where I’m at, while still maintaining some integrity to my roots. In galleries and/or independent theatres I still try and incorporate festive elements you may find in a drag bar, perhaps there is more wit, more nuance a mix between a few things but I don’t like to pretend that the night club audience is less intelligent than the arts community. It is important to not under-estimate the people viewing your work, they know more than you might think and if they don’t, you gave them a basic structure to further research if they are inclined to do so. As an artist it is my job to speak what I see as the truth. As Nina Simone once said, ‘reflect the times’ the rest is up to you. As an artist, and in life, we have our comfort zones, our stretch zones (spaces where we feel we are pushing ourselves, growing and developing) and our panic zones (spaces completely beyond our capacity that we feel ill equipped to handle). Where do you see your work? What ideas/concepts are comfortable to you, what makes you grow and what ideas/concepts push you beyond your limits? Interesting: Working on a new performance always scares me. Even developing a pre-existing performance puts me into a panic. Am I ruining a good thing, was this even a good idea to begin with, am I serving my community, concepts and ideals well enough? These are the questions coming through my mind constantly. That, I think is one of the strengths of performance art, you cannot hide behind your work, you are your work, any experiment that goes wrong, line you mess up, move you wish you had not done, it is all on you. It is a very high risk creative medium but that high risk factor can take your work to amazing places and allow you to breathe, take a second to relax before you look at that piece again and all those thoughts come rushing back. Basically I think feeling comfortable and calm before a performance, or to feel content with a performance is a warning sign for me. If I’m not tense, something is not right. South Asians inclusion in explicitly Asian American spaces is not always a given. How does this impact your relationship to Asian American identity and the ways in which you choose to engage or not engage in Asian American spaces? The other day I was watching a video made by MTV about racism among white gay men and straight women towards Asian men. They showed a map of Asia. The entirety of the Middle East and Pakistan was excluded. The map showed Asia as starting in India and ending in Indonesia. The exclusion of South Asians, Arabs, Iranians, Kurds and Turks from the narrative of Asia is not only grossly historically inaccurate but also an intentional political tool used to further alienate the middle East and Muslim countries. Somehow according to this MTV video and to many white Americans, the Middle East is a separate continent, we have 8 of them now not 7, that was a typo in your geography book. So that is how I feel about non-Asians excluding South Asians from the narrative of Asia. When South Asians are excluded from Asian creative spaces it is a reflection of how white society has seen and categorized us for their own benefit, for their censuses, their tallies and their racial targeting. We repeat that, not because we hate each other but because our histories in the United States have evolved separately because we have been historically separated. It is not unfair to say that when we speak of oppression, history and culture, we are speaking from many different points of view. Asia is large and Her people diverse. When APAture does make a point of bringing in Asian artists from across Asia I think it is a huge statement to creating bonds and forming points of collaboration and solidarity that both take into account our differences but also our similarities. What are the interconnected threads we wish to investigate and untangle? What is there to discover when we unravel? Experience performances by Zulfi, Faluda Islam and more at the APAture 2017 Performing Arts Showcase happening Saturday, October 21, 1:30-4PM at the Asian Art Museum! Make sure to also take a look at the other showcases for APAture 2017!